It's a sad fact that trillions of plastic bags are consumed every year, taking its toll on our environment. This is not only an eye sore to look at, but costs billions for retailers...which costs the consumer more money! Plastic bags are also not biodegradable. Plastics break down into small, hazardous waste that poison soil, trees, wildlife, and ultimately the water supply. Switching to reusable bags can save on the average over 300 bags per person! With small changes, we can all make a huge difference in slowing climate change and restoring our environment to a cleaner, healthier place. Reusable bags are a small step in the right direction! 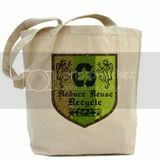 Bring these canvas grocery tote bags to the store, give them as eco friendly gifts, and curb your plastic consumption. In our store, you will find a variety of reusable canvas shopping totes which can be used for anything from grocery shopping, beach trips, baseball practice, or just going to work everyday. 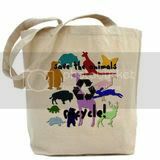 Brand new to our store is our Just Say no to Plastic bag, and the Make Plastic Extinct Tote bag. Also be sure to check out our new line of organic t-shirts! Whether you're looking for an earth friendly gift or an environmentally safe shirt with a positive message, we have a full line for you and for kids! Browse our organic onesies, organic kids t-shirts, and other organic apparel! Start spreading the word, start using reusable bags and Go Green! Click on an image below to view product details! Go green with reusable Sigg water bottles! Backed by a lifetime warranty, these have a BPA free lining, are crush resistant, and are eco friendly alternatives to plastic! Featured here are original green designs that have a unique green twist. Browse all of our green themed designs here! Whatever the occasion, you can find a reusable bag that would be the perfect to compliment your gift. Browse by occasion here. Find a unique selection of animal tote bags like our Polar bear tote bag, Penguin tote bag, Piping Plover bag, and Save the Animals tote bag in this section. Mousepads, t-shirts, mugs, ornaments and more, all with a green twist! 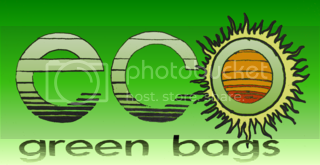 Keep it green with reusable bags by state! Featured here are bags featuring states from all over the country. Buy one from where you're from, or collect your favorite states. All of these shirts are 100% organic cotton that's soft, durable, and much better for the environment than traditional cotton. Use these Trick or Treat Halloween bags over and over again! Plenty big for lots of Halloween candy, and great for the office, school, or grocery shopping! Be sure to check out our unique vintage style city bags featuring cities like San Francisco, Houston, Boston and Chicago! Gear up for fall with autumn themed foliage bags! 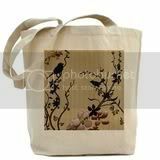 Trendy and reusable, you can find several different canvas bag here featuring foliage and New England scenery. 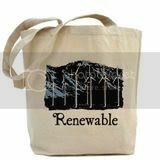 EcoGreenBags specializes in unique reusable grocery tote bags and cool organic t-shirts! We have a number of unique green living t-shirts, sustainable apparel, eco friendly reusable bags, and themes by the month. From the United States? Stop by our 50 states reusable bags section, where we highlight each state with its own "go green" tote bag! Some of our customer favorites are our renewable energy tote bag, birds and cherry blossoms bag, medieval vintage reduce reuse recycle bag, and our save the animals tote bag. These bags are built to last! 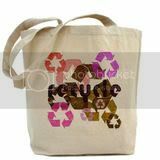 Use them for grocery shopping, the office, for school, or give our earth friendly tote bags as the ultimate eco themed gift.